Dem-Quip uses proven concrete-cutting techniques with quality equipment and experienced operators. 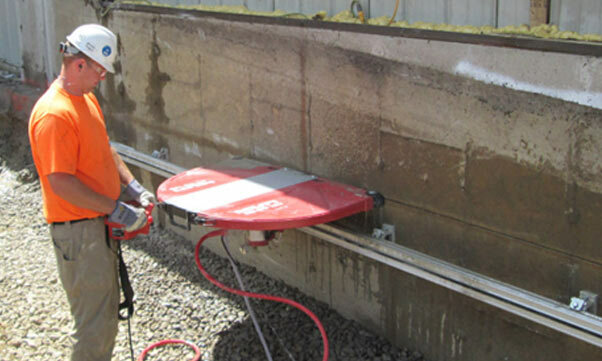 Wall sawing, also known as track sawing, is the most effective cutting solution for vertical or sloped surfaces made of concrete, reinforced concrete, stone, asphalt, or cinder block. The procedure uses a circular diamond blade, usually attached to a track-mounted machine, allowing for precise placement of the saw cut. The track system enables the wall saw to be attached to just about any horizontal or vertical surface, including steep inclines and floors. Wall saws run on hydraulic, air, or electric power—and can make both straight and bevel cuts. The wall saw is an excellent choice for creating precise openings in any concrete structure. This procedure is one of the cornerstone cutting solutions offered and a procedure that requires specialized experience and expertise in concrete cutting in UAE. We have both. We use this solution when creating openings through reinforced concrete walls and slabs, in addition to numerous other applications. Wall saws are known not only for their precision cuts and speed but also for their safety, when in the hands of experienced operators. Precision cuts in any vertical or horizontal concrete structure, even those with steep inclines. Various HVAC applications, including wall cutting for ventilation purposes. Creating openings through reinforced concrete walls and slabs. Construction of wall, doorway, and window openings. Wall saws are known not only for their precision cuts and speed, but also for their safety. Wall sawing produces minimal noise, dust, and debris. Wall saws can be used indoors or outdoors. Wall sawing preserves structural integrity. Wall sawing is a cost-effective concrete cutting technique. Wire sawing is a quick, efficient, and economical solution. It’s the ideal solution of concrete cutting in Dubai for structures that are too large or unwieldy for traditional saw cutting. When it is impractical or impossible to saw through heavily reinforced concrete, hard metals, steel, or even rock, we rely on this relatively new method to save both time and money. 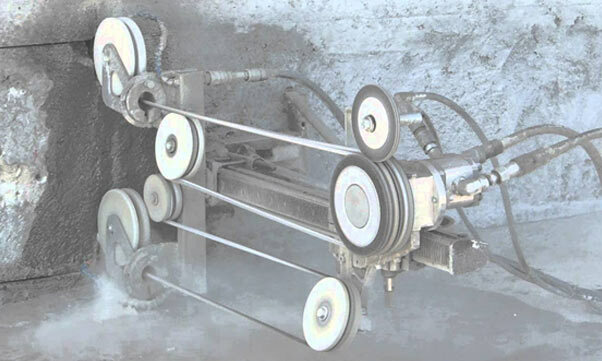 Wire saw systems rely on a series of guided pulleys to draw a continuous loop of diamond impregnated wire through otherwise impenetrable material. This technology creates any desired shape or directional cut with ease. Wire saw systems are flexible, suitable for use in confined spaces and limited access areas, while retaining the ability to cut vertically, horizontally, or on an angle. Wire saws can even be used underwater! No concrete structure is too large to cut with a wire saw. Faster cutting times and low noise output make it the perfect solution when conventional cutting methods fall short. By using state-of-the art technology, and advanced techniques, our skilled saw operators easily slice through walls and slabs of any thickness. Wire sawing is an environmentally friendly concrete cutting solution, with minimal noise or air pollution. Wire sawing results in precise, accurate cuts, leaving surfaces smooth and clean. Wire sawing is quick, efficient and economical. Wire saws cut through virtually any material, from reinforced concrete to solid steel. Wire saws are flexible and versatile, a superior solution for hard to reach spaces, or even underwater. With wire sawing there are no limits to sawing depth. We provide our clients in the construction field with equipment and qualified operators that will contribute to maximizing their competitive advantage.